Learn the difference between Injection Molding and Injection Stretch Blow Molding (ISB) Construction and how that affects your packaging choices. With both Injection Molding and Injection Stretch Blow Molding construction, plastic pellets are melted and pushed through an extrusion machine screw which forces them into a desired mold shape. What differentiates them is how the part is formed once the plastic is pushed through the screw. With injection molding, molten plastic is pushed with high pressure through a small hole, or injection point, into a closed steel or aluminum mold cavity, or space, formed by two corresponding parts (often referred to as the male and female cavities), forming the plastic into the desired shape. The mold opens and the completed part is removed. Examples of Injection Molded containers are open head pails, tubs, caps and closures and applications that require precise fit and exacting quality standards. With Injection Stretch Blowmolding (ISB), the molten plastic is formed through a die into a hot, hollow plastic tube called a parison that is lowered between the two mold parts that close on the form. Air is forced inside the cavity and forces the softened plastic into the desired mold shape. The completed part is then trimmed and removed from the machine. Examples of ISB containers are UN tighthead bottles and Jerrycans, and PP or HDPE household, food and chemical bottles and jars. For more information on which product is right for you, please contact one of our Packaging Specialists. Illing Company is dedicated to Packaging Your Vision. Diameter: The distance across an opening. The inner diameter is the maximum measurement from the inside of the opening, from one side to the other. The outer diameter is the maximum measurement from the outside of the opening, including the bead and/or tearstrip and handle, if applicable. Height: The measurement of the pail from the bottom of the chime to the top of the bead. With cover engaged, the maximum dimension of the bottom of the pail to the top of the cover. Satellite Rings: Horizontal ridges of plastic designed for increased top load and lateral strength. Wall: The thickness of the part. Wall thickness varies depending on the part construction and requirements. Chime: The ridge of plastic at the bottom of the pail that extends beyond the pail floor. Bead: The rounded curl at the top of the pail designed for engagement with the undercut of the cover. 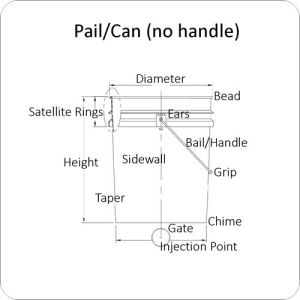 Ears: Pail feature on the side of the pail with opening for metal of plastic handle. Bail (handle): Plastic or steel wire strap for carrying. Grip: Plastic tube inserted over bail or handle for ergonomic comfort and rotation. Taper: The angle at which the sidewall angles from the top of the pail to the bottom. Gate: The recessed opening that allows the molten plastic to be injected into the cavity of the mold. Injection point: The small point at the center of the gate through which the molten resin is forced into the mold cavity. Fitment: Any secondary option to a pail or lid construction such as spouts, screw caps or vents. Fitment insert: Removable molding insert allowing for various options within the same molding component. Tear Strip: Removable strip of plastic to ease in opening and indicate tamper evidency. Undercut: The ridge of plastic in the tear strip that ensures a snap seal over the pail bead. 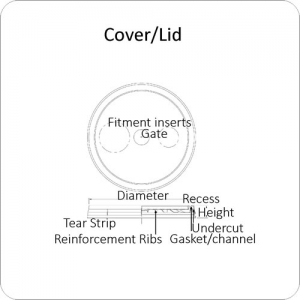 Gasket: Rubber, foam or plastic inserted in the lid channel between the pail bead and lid for leak prevention. Gasket material will depend on the application compatibility. Lid Channel: Recessed opening in the outer perimeter of the lid designed to wrap the pail bead and engage the lid. Reinforcement Ribs: Lateral ridges of plastic on pail chime and/or lid for increased strength. Lid Recess: The horizontal drop from the lid ring to the flat lid panel. Filled pail rests in the lid recess of the package for stack stability.